This palette has been on my wishlist for what feels like years now--I've been waiting for it to come up on Hautelook, but it never has! To me it is the perfect fall palette, so when I ordered the Jaclyn Hill palette I decided to add this to my cart, too. I'm really glad Morphe is now coming to Ulta so that more people can buy their products and bypass their website and shipping charges! I wish I'd known that before placing this order, but oh well. I got my palettes in the end and I won't go into it anymore. The 35F palette has thirty-five shadows in a variety of matte and shimmer finishes. The color scheme is perfect for fall, with some beautiful purples, bronzes, and taupes. I'm a big fan of purple shades so I've been liking that aspect of the palette most so far! The packaging is standard black plastic for Morphe. I have one other palette from them so I'm planning on doing something to the outside packaging to make them distinguishable from each other. The palette is huge, probably not something that I would travel with, but it feels sturdy enough even though it feels cheap. There is no mirror and the shadows are about standard single-shadow size. They don't have names which is always annoying. Out of the thirty-five shades, only seven are matte and the rest are shimmers and metallics. 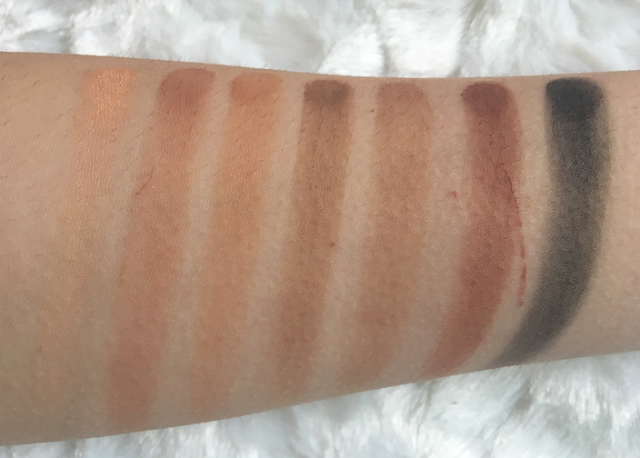 While I think Morphe does their shimmer shades really well, almost like Makeup Geeks foiled shadows, I would have preferred a few more mattes to help make the palette more usable. 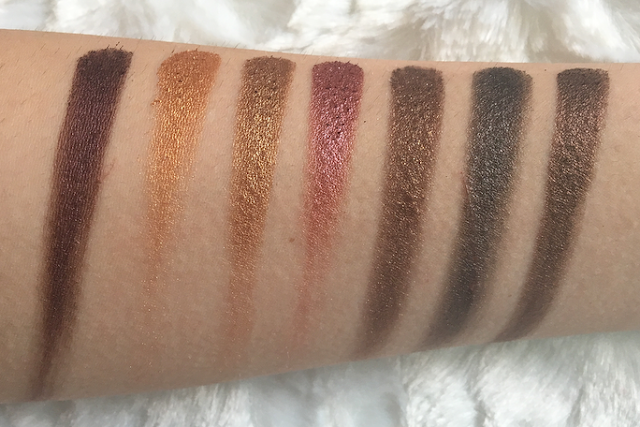 There are definitely some shades in the shimmer formula that seems to repeat throughout the palette. Does anyone really need four different highlighting options? I would have liked to see more crease shades and a cream color to set my eyeshadow primer with, personally. Row one has a variety of highlighting shades and a few nice, basic all-over the lid shades. Like I mentioned, I would have preferred only one or two highlighting shades and then a matte cream shade for a browbone highlight. Row two has some gorgeous bronze and taupe shades. 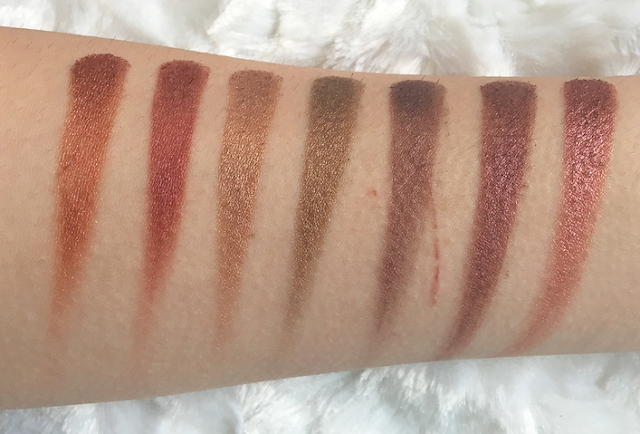 Row three has warmer berry shades, perfect for fall. Row 4 has darker metallic shades. I love this gold! The mattes in Row 5 are pretty lackluster compared to the metallics, but they are basic and useable. I would have liked some more crease shades and more mattes in general. Like I mentioned, the metallic formula is probably Morphe's best and there are some really stunning shades in this palette! I find that most Morphe palettes don't have much variety in their shades. It always seems to be 35 shades of brown, 35 shades of orange, etc. This one has more variation which I like. 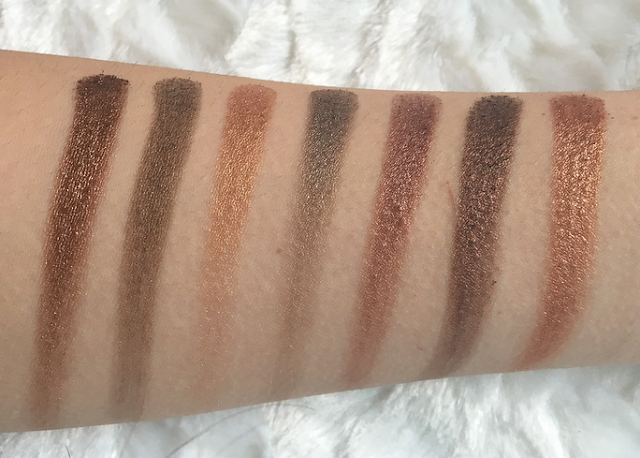 The mattes are soft and easy to build up, but they aren't very pigmented on first application. The shimmers are absolutely stunning. They can be packed on with a brush, but I find using my fingers to be easier and it creates more of a wet, foiled look. They can also be used with setting spray to make them even more intense. So overall, do I recommend this palette? I think if you're on a budget and want a variety of shades, I definitely would! There are so many different looks you can create with it. However, if you already have lots of neutrals and you either have or don't like the purple shades, you can pass on it. I personally love these shades for fall and I like having several different purples to choose from in one palette. However, I will definitely be going to Ulta and not to the Morphe website the next time I get a palette or brushes from them and I recommend you do the same! 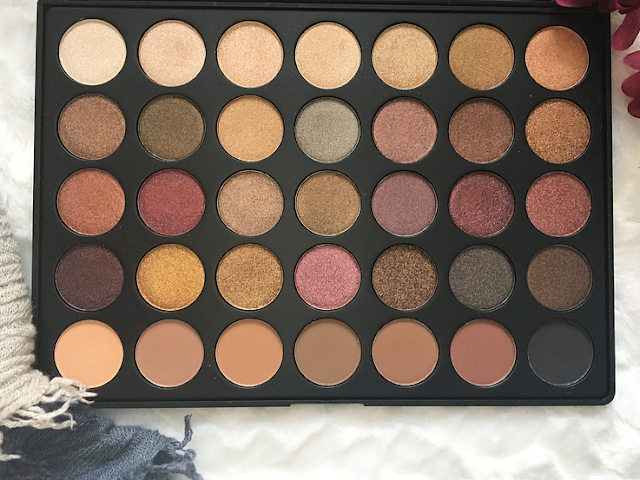 17 comments on "Morphe 35F Palette"
I want one if their palettes as well. Love these shades! The Jaclyn hill palette has been on my wishlist. 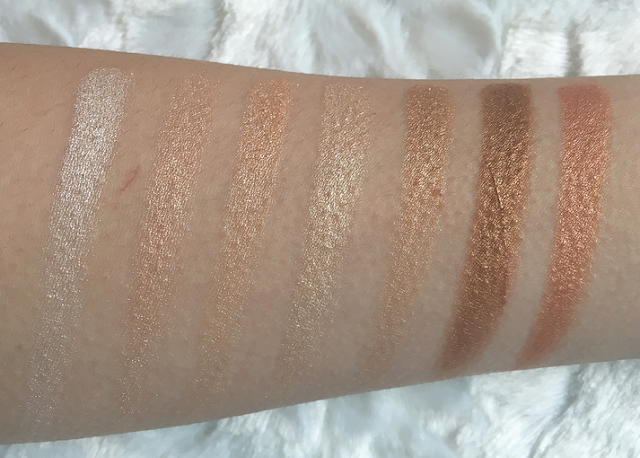 I definitely want to get my hands on this, I am a sucker for a good neutral palette! What a gorgeous shade range in this palette! But I know what you mean when you say that you'd pass on it if you already had a lot of neutral shades. But can you ever have enough? Hehe. Love the beautiful shades in this palette. The love shimmers they are so pretty. I have been wanting to get Morphe palettes but am unable to decide which one, as you mentioned all the shades look similar shades of brown and orange. :-) But have seen so many blog posts hopefully I will be able to decide. Although I don't have any Morphe palettes, I really want one haha Rows 2 and 3 seem like something I would use the most. I get your struggle with mattes in this one, but I think you can make a nice look just using this palette. Morphe has some of my favorite palettes. I agree, the metallic shades are great. The 35F is gorgeous and I really like this one. I just picked up the 35o2 Second Nature palette. All of these colours are so beautiful and so well pigmented! I swear I am the only beauty blogger who hasn't tried anything from Morphe! LOL! This palette looks incredible! The range of colours looks good. Such a gorgeous palette! Love how pigmented the shadows are! Theses shawdows are gorgeous! This palette is definitely going on my wishlist ! !